We recently gave a couple of areas of our home a new look with the help of Dulux. Starting today, I'm going to share these with you over two parts, detailing a little about the paint selection process, along with some of the other renovation details. 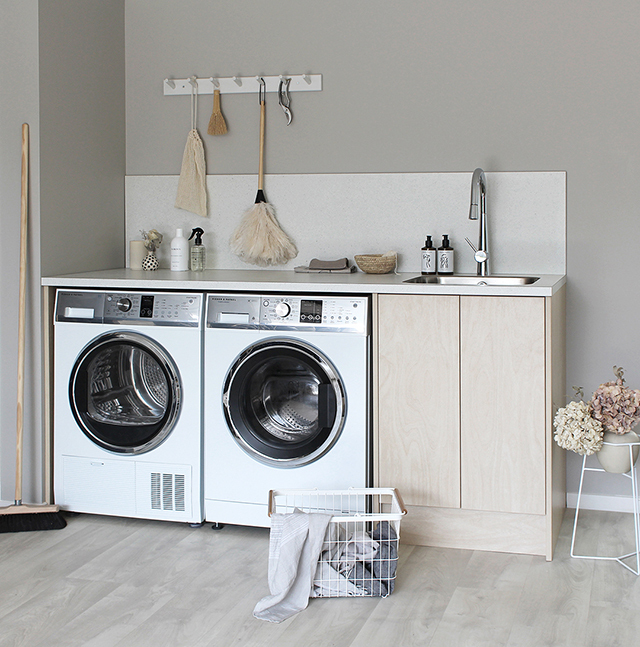 You may have caught our new laundry over on my Instagram. 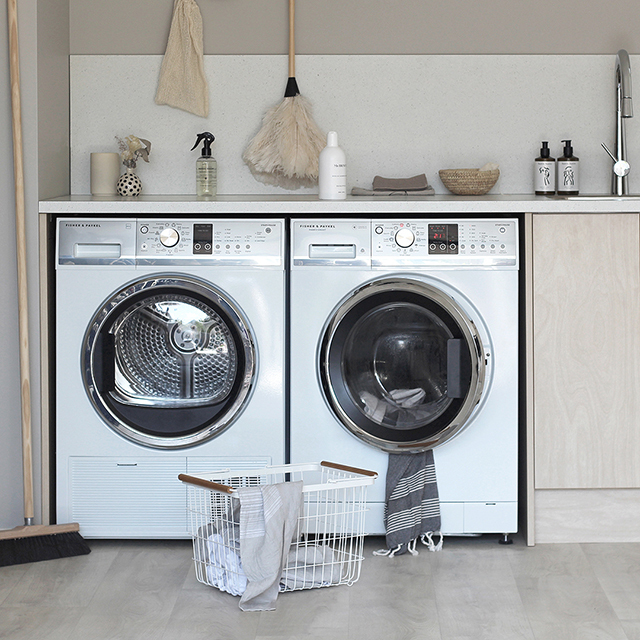 A recent collaboration with Fisher & Paykel, our new washer and dryer set was great motivation to give the space a much-needed makeover. As always, the paint colour was an important factor, and I went through my usual process of looking through the Dulux colour charts and choosing large Colour Swatches. Sticking them on the wall, comparing similar shades and seeing how the colours look in different light, I know that I can then confidently decide on the best one. The paint colour for the laundry was determined once I had all the other elements underway. I first selected the materials for the cabinets and benchtop. Having loved working with the Melteca range in this recent shoot, I was excited to choose from their range for the cabinets. One of my favourites from the woodgrain collection was the Raw Birch Ply. It's a lovely light wood colour with a textural grain, perfect for carrying the Nordic style of our home through to this area. Choosing a material for the benchtop from Melteca's parent brand Laminex, I narrowed it down to a selection of stone/marble-look finishes in neutral shades. Finally deciding on the Pure Mineralstone in natural finish, it pairs beautifully with the Raw Birch Ply. 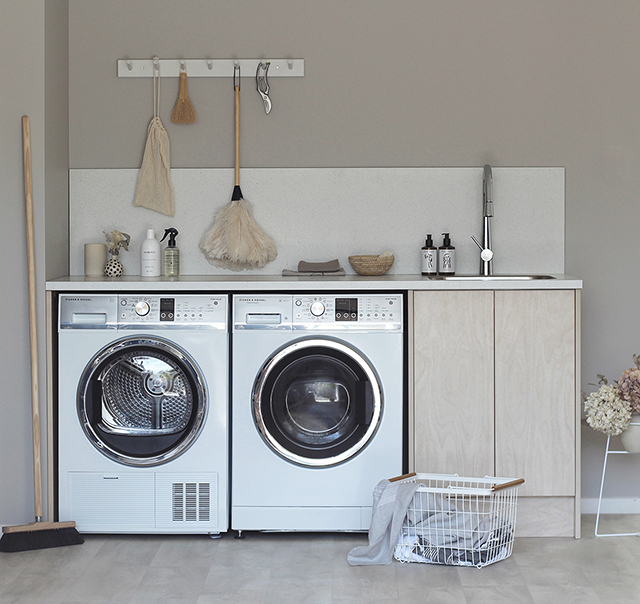 When it came to the flooring, we had to consider the fact that the laundry is located in our garage. My husband has always wanted to put down garage carpet (watch this space) but I had different ideas for the laundry. I managed to convince him it would look better to have an alternative finish that would define the laundry area, while fitting seamlessly side by side with the carpet. Because this was a DIY project, easy installation was a big factor, but we also needed a durable, low maintenance option that would work well in a wet area. Flooring Xtra Sheet Vinyl was the perfect solution. Popular due to its hardiness and flexibility, it's easy to clean and resilient with underfoot softness, making it great for standing on for long periods. Having spent many hours doing washing on unforgiving concrete floors, this really appealed. From Flooring Xtra's extensive range I had no trouble finding the pale wood finish I was after, and my final choice, Ultimate Oak in Calais - cream wood plank is a perfect fit. Both the flooring and flecks in the benchtop have greyish tones and this guided my choice when it came to paint colour. Choosing greige and soft grey Colour Swatches, I stuck them to the wall to see how they looked throughout the day and night. I kept coming back to Dulux Midhirst Half. The same colour I painted my office, it's such a beautiful, calming hue to live with, and because my office is in close proximity to the garage, I liked that it would provide a sense of cohesion. It's really satisfying when you find that colour you really love. Wanting to help Kiwis choose the right the colours for their home, Dulux have created Find Your Colour, a range of services which you'll find on their recently updated, easy to navitate website. This includes the Colour Guide, which explains the power of colour, important things to consider when choosing colours for your home, and how to create the right colour scheme. For further help and advice, you can visit a Dulux Colour Expert in store, or book online to have a qualified interior designer visit your home to help you choose. With the colour sorted, there were just a few more key pieces to complete the first stage of our laundry/garage reno. When it came to the sink, we wanted to go with a square shape, and as big and deep as the space would allow. We found the perfect solution through The Kitchen Hub. They also helped us source a mixer with a pull-out spray - a must for hand-washing. For the finishing details I went to Father Rabbit, my go-to for all things utility. They stock a gorgeous collection of laundry/cleaning products and I was very happy to test out some new products and finally replace my old broom. You'll find the links for these, and all the other products below. The next step is to install some matching cabinetry for the wall above the sink, and some handles for the cabinets. Stay tuned for Part 2 of this Dulux series which I'll be sharing later this week, and in the meantime, be sure to visit the newly updated website dulux.co.nz.